In the 17th Century brewing beer and the associated malting and hop growing/drying were cottage industries, widespread across the country on a small scale. But there was steady expansion through the century. Gerard’s Great Herbal, hugely popular for many years extolled the virtues and wholesomeness of hopped beer over common ale. One report suggests that hops were to be found in 14 counties by 1655. There is a reference to hops grown at Hatfield, Hertfordshire by 1589. A field called The Hopyard at Littleton, Worcestershire is recorded in a document of 1636. Writers in Surrey at the end of the century spoke of hops well established around Farnham by the end of the 16th Century. Yet Worlidge writing in 1697 complains that more hops needed to be planted to meet the Kingdom’s needs and avoid inferior Flemish hops being imported. (A thoroughly xenophobic attitude to foreign product was establihed from the start.) Entries in Parish and Estate records indicate that groups of hop pickers from London and elsewhere started to travel to the hop gardens. The majority of hops were used by local brewers in the neighbourhood, but during the 17th Century sale of hops became a feature of the famous Stourbridge Fair at Cambridge, even though it was not near the hop growing areas. By the 1680s there was a hop market in Hereford and in London at Little Eastcheap. Later the latter moved to Borough High Street in Southwark which continued as the commercial hub of the hop business until the 20th Century. Shepherd Neame Brewery was established in Faversham in 1698 on a site where brewing had been carried on for at least 100 years already. Taxation was of a highly contentious subject in the age of the Stuart Kings and the Commonwealth. There were protests from many quarters against the detestable Excise Tax on hops and other produce, even though one aim was to penalise foreign hop imports. Tithes payable to the clergy who had a right to come and pick 10% of the crop for themselves did not endear the church to the wider community. 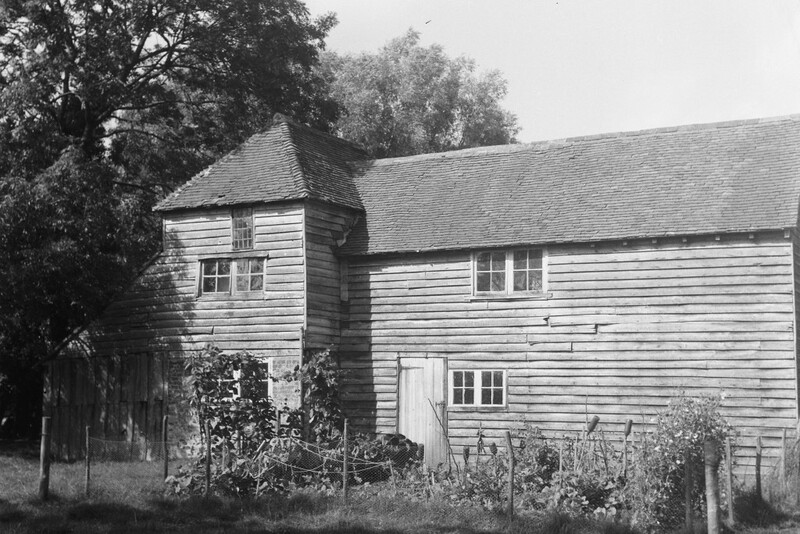 The most typical oast/hopkiln of the 17th Century in both the South East and West Midlands was the rectangular “barn” style which came before the development of the pyramidal roofed kiln (which we think of as the classic kiln). The kiln was an integral part of the building.The Scott model placed the drying area in the middle of the building. 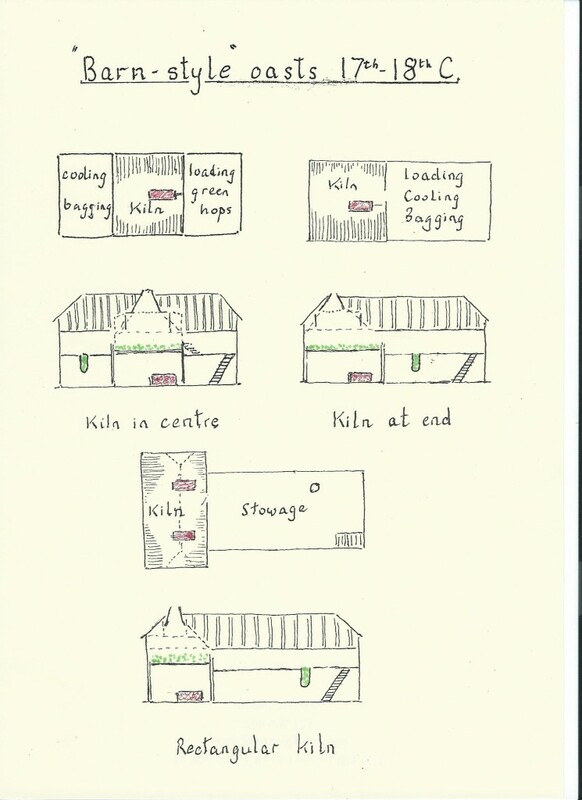 It seems that it quickly became more common to place the kiln at one end of the building, as shown in my diagram. 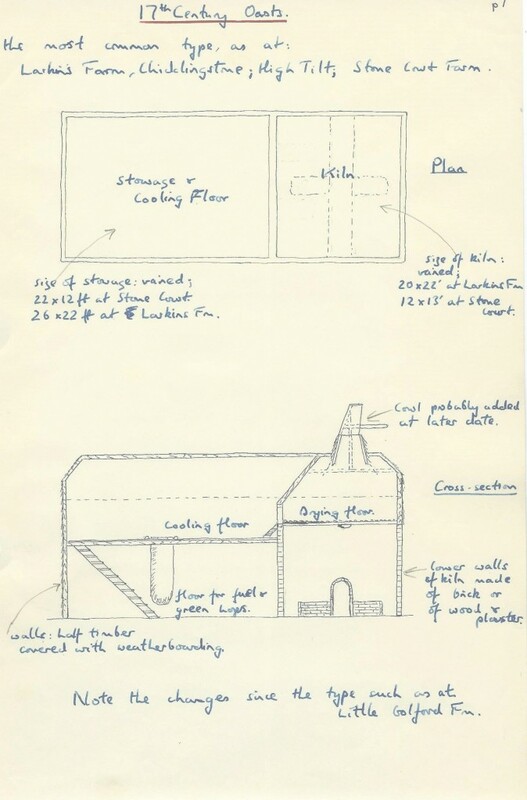 Two significant improvements on the Scott model were adding an upper floor in the stowage for cooling and bagging the hops and enclosing the kiln from the level of the drying floor up to the roof vent in the form of an inverted funnel. This would have been more efficient than leaving the smoke and reek to swirl about the upper levels of the whole building, as in the Scott model. The internal conical kiln structure also started to project above the ridge of the roof. These developments are shown in my diagram but there is no evidence now about when they became common practice. As for an upper cooling floor, as late as 1726 John Lawrence in A new System of Agriculture writes about “pushing the hops out through a window with a coal rake” from the kiln. kilns with stoves with chimneys which vented smoke and fumes externally which could burn cheaper, dirtier fuels. The capital cost of the latter meant that that there was probably very little up take in iron stoves in the 17th Century. Richard Bradley, Professor of Botany at Cambridge University published The Riches of the Hop Garden Explained in 1731. This included a floor plan of an oast almost identical to Scott 150 years earlier and a throw away comment that a description was unnecessary as “everyone knows the structure of it” especially around Canterbury and Farnham. He declares that there is much falsehood in the hop business so bags must be cut open in several places to check quality. Estate account books and contracts provide evidence of oasts being built in the 17thCE. One of the earliest is from Robertsbridge where tenant William Hopkins had a hophouse with garden and back yard in 1597. Estate and Tithe Books refer to hop growing (and therefore drying) on a small scale in many locations in the High Weald. Example include instructions to build an oast at Flimwell, Ticehurst, East Sussex in 1671, and an oast on the Boarzell Estate, Hurst Green, East Sussex from 1666., Other references to hop kilns come from documents from Herstmonceaux and Lamberhurst. Inventors lodged patents for new kilns and furnaces. One from 1635 was for a kiln for “the sweet and speedy drying of Mault and Hoppes by the use of Sea Coal, Turfe, Broomee, Furzes, Heath and any other Fewell and that without touch of Smoke”(Notes Bk 2 p 16).